Elliebelly Knit & Dye Works > Blog > Dyeing > Yarn Everywhere! 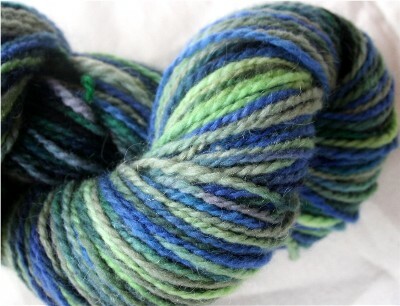 I have yarn for sale, well, it feels like everywhere this week, even though it is really just two places. In addition to Midday Faire, where yarn will be available Tuesday at noon, I’m the guest artist at Club Thread for the next two weeks, beginning this Wednesday. At Club Thread, I’m doing several collaborations with the very talented Tara of Urban Fibers, including peasant tops in Amy Butler Fabric with coordinating yarn, and, for next week, an incredibly wonderful knitting bag made by Tara and filled up with some of my favorite yarns, including the elusive Treasure colorway, and stitch markers. 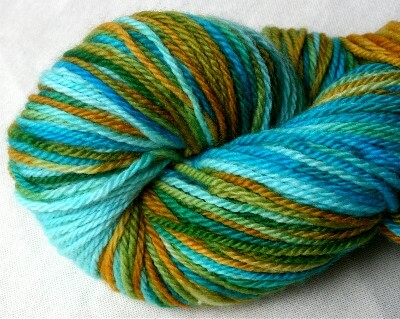 And this is my new favorite colorway for sock yarn, on superwash Blue Faced Leicester. This is Poppy and I’m in the middle of doing a pair of baby socks out of it, which I have to photograph and show you later today because they are adorable. For now, here’s the yarn. I hope everyone finds something to lust after. I’m off to start thinking about Harry Potter knitting goodness. I’ve joined the Knitty Harry Potter Swap, and can’t wait to start coming up with some great ideas and items to send! Oooh, the yarn is gorgeous! I’m a huge fan of BFL, and you’re obviously very talented at dying. I’m so glad I get to be your HP Swap partner; I’ve got a lot of ideas to get working on for you! I love everything. 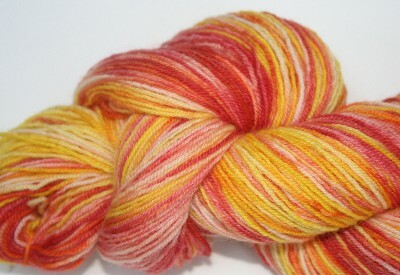 I may just have to break my yarn fast and buy up all your dragonfly before it disappears, though. How many do you have left?